Sermon by Pastor Bob Young “One Way for Righteousness” Scriptures: Romans 5:1-11 1. The Believers Peace with God (v. 1). 2. The Believers Standing in Grace (v. 2a). 3. The Believers Hope of Glory (vv. 2a-5a). 4. The Believers Possession of Devine Love (vv. 5a-8). 5. The Believers Certainty of Deliverance (vv. 9-10). 6. The Believers Joy in The Lord (v. 11). Sunday, April 7: 9 am Adult Co-Ed Bible Study “He Chose the Nails”, Worship Service, Prayer Requests, Nursery, Children’s Church and Youth will be dismissed by pastor after morning prayer, Sermon, and Communion. Elder Open meeting tonight 6 pm and closed meeting at 7 pm. Wednesday, April 10: Celebrate Recovery 7 pm – Give Lesson #23 – Meal served 6:15– 6:45 pm. Thurs – Sun, April 11 – 14: Come Alive Revival. Thursday – Saturday 7 pm and Sunday 10 am. Church Revitalization Seminar “The Highly Influential & Effective 21st Century Church” Saturday, April 13th 9 am – 1 pm. Lunch provided. Sunday, April 21: Easter Sunrise Service 6:45 am. Easter Service 10 am and Easter Egg Hunt after church service. New Member Meeting with Pastor. Sunday, April 28: New Member Introduction. Wednesday, May 8: Celebrate Recovery 9th Anniversary, we want to invite the whole church to come celebrate with us. Meal served 6:15 pm to 6:45 pm. It’s also testimony night. Saturday, May 18: Team Roping Benefit for Shaydon Pitts 11 am. We need wrapped candy to stuff Easter eggs for Easter Sunday. Please give candy to Marsha Herriage or place it in the children’s classroom. 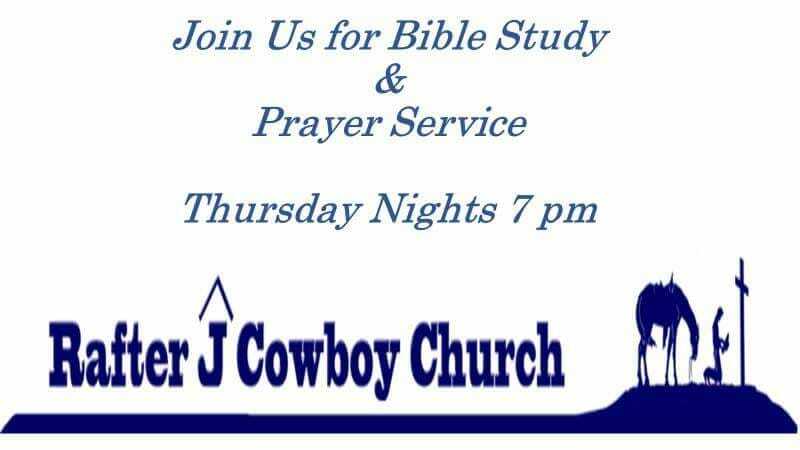 Visit www.rafterjcowboychurch.org or email rafterjcowboychurchemail@gmail.com with announcements or schedule calendar events. For prayer needs please call or text Janie Duke at 972-834-9355. Celebrate Recovery @ Rafter J Cowboy Church – Wednesday, April 3, 2019 – Testimony Night. We invite you to join us for Testimony Night! Principle 8. Yield myself to God to be used to bring this Good News to others, both by my example and by my words. “Blessed are those who are persecuted because they do what God require message to others and practice these principles in all our affairs. Step 12. Having had a spiritual experience as the result of these steps, we try to carry this message to others and practice these principles in all our affairs. 214-229-6457Rafter J Cowboy Church Celebrate Recovery Ministry. Rafter J Cowboy Church Bulletin for Sunday, March 31, 2019. 1. Be Dead to Sin and Alive to Christ (vv. 1-10). 2. Offer Our Bodies to God (vv. 11-13). 3. Yield to Grace (vv. 14-15). Sunday, March 31: 9 am Adult Co-Ed Bible Study “He Chose the Nails”, Worship Service, Prayer Requests, Nursery, Children’s Church and Youth will be dismissed by pastor after morning prayer, Sermon, and Potluck lunch after church service. Wednesday, April 3: Celebrate Recovery 7 pm – Testimony Night – Meal served 6:15– 6:45 pm. Thursday, April 4: Bible Study and Prayer 7 pm. Studying the book of Revelation. Thurs – Sun, April 11 – 14: Come Alive Revival. Thursday – Saturday 7 pm and Sunday 10 am. Prayers please. We need wrapped candy to stuff Easter eggs for Easter Sunday. We prefer no chocolate candy as it melts. Please give candy to Marsha Herriage or place it in the children’s classroom.